By John Montgomery The next stop for the Chicago Force is a trip to Heinz Field in Pittsburgh for the WFA championship game. The Force(11-0) advanced to the title game for the second time in team history with an exhilarating 35-34 win over the Boston Militia (10-1) last Saturday night in Evanston at Lazier Field. The Force will face the San Diego Surge (11-0) on Saturday, August 4 at Heinz Field in a game that will be televised by ESPN. "It's huge for us," quarterback Sami Grisafe said after the win. "We haven't been to the championship since 2008." Grisafe played a role in winning the National conference championship completing 14-of-16 passes for 128 yards with one touchdown pass. Chicago earned a trip to Pittsburgh despite a scoreless second half as the Militia overcame a 35-14 deficit. Boston's Whitney Zelee (11 carries, 143 yards) scored on a two-yard run to cut the lead to 35-34 with 1:57 left. All the Militia needed to do was kick the extra point to send this exciting contest into overtime. Danielle Resha missed the PAT by kicking the football under the crossbar to seal the victory for the Force. 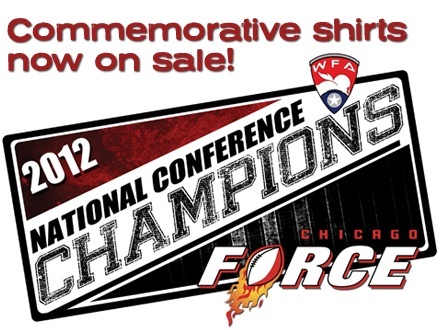 "I feel happy to win," Chicago Force head coach John Konecki said. "We just beat a very good team." "I feel lucky in that respect because it's a game of inches," stated Smith. "It worked out for us." "I wouldn't trade her for the world," Boston Militia head coach Derrick Beasley said of Resha. "She's probably the best kicker in the league." The first half provided little drama as the Force played its best half of the season in taking a 35-14 advantage. Smith scored four touchdowns and rushed for 100 yards by halftime. 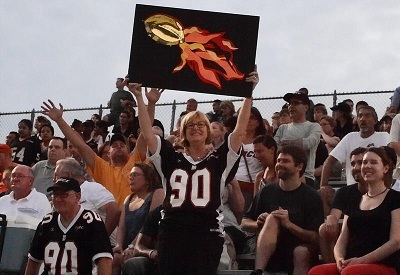 On the opening possession the Militia showed fans and reporters why they have won the championship the last two seasons with a 62-yard drive to start the game for a 7-0 lead. 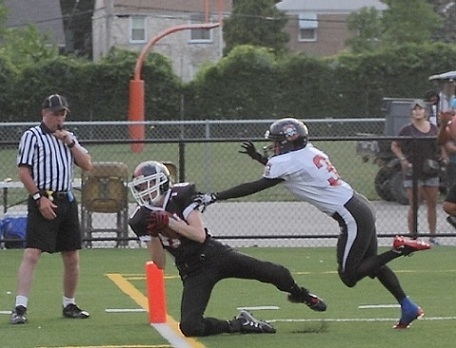 The Force answered as Grisafe threw a six yard touchdown pass to Trish Harper to tie the score with Tricia Charbonneau's PAT kick. Boston failed twice on fourth down attempts in the first half, and Beasley admitted after the game that he wanted to punt on both occasions. Chicago took advantage of those miscues and a turnover to take a 21-14 lead. Smith scored on a 14-yard run with 7:28 left for a 28-14 lead. Smith, who rushed for a total of 163 yards in the game, scored with four seconds left on a three yard run to give the Force a 35-14 halftime lead over the unbeaten two-time defending champions. Boston quarterback Allison Cahill completed six passes in the second half to help rally her team. Zelee scored twice including a two-yard run with 1:57 remaining. Chicago prevailed as Resha missed the extra point and Smith had a 28-yard run to help Chicago run out the clock and seal the game on the final series, sending the Force to Pittsburgh. "It's surreal right now," admitted Smith. "We knew it was going to be a dogfight." "They are champions for a reason," Konecki said on the Militia. "They fought like crazy. I am so proud of my team." Boston beat Chicago last season 50-23 en route to back-to-back titles. Smith has had an amazing season with 33 touchdowns after being away from the game for four years. "I came back and didn't know what to expect," Smith said. "I knew it was a pretty intense game. I definitely wanted to give it my all and see what happens." What happened is Smith helped lead Chicago to an undefeated season and into the title game against San Diego. The largest and loudest crowd of the season cheered on the Force in their conference championship victory over the Boston Miltia on July 21. Seen here leading many in the crowd is JoAnn Okey, Mom of Force player Elizabeth Okey.